What Do Ears Back Mean on a Dog? Have you ever wondered how your dog was feeling about a situation? While dogs are not able to speak and relay their feelings through words, they have developed another way to communicate with us instead. Dog expressions conveyed through body language can alert you to whether your dog is comfortable, frightened, angry, or happy about a situation, and your dog's ear position provides key insight about her comfort level. Pinning her ears back can mean any number of things, but with an understanding of dog body language, you can understand what your dog's posture is indicating. Body language refers to the way that your dog uses his body to communicate with others. By changing the position of his ears, tail, lips, and more, your dog can clearly convey whether he is angry, threatened, or happy, among other emotions. Other dogs can understand this body language and communicate through their own signals and posture. According to Vet Street, your dog uses his body language to communicate anxiety and fear, and he will often do this when he is in a situation that could escalate to aggression. The signs that he provides can be subtle, but if you learn how to read his body language, you can better understand how your dog is feeling. Integral to a dog's body language is ear posture, but it isn't always easy to spot. The American Society for the Prevention of Cruelty to Animals Pro states that because different breeds have different ear types, it is often easiest to see ear posture and changes in dogs who have erect ears. However, even breeds with floppy ears do move the bases of their ears forward and backward, so in those cases, it is more important to look at the direction of the base of the ear. Dogs often pair ear posture with other body language signals, but let's focus on recognizing ear posture signals to start. According to DogTime, the neutral position for ears is the natural position in which your dog's ears fall. A relaxed, content dog will have her ears in a neutral position when she's just resting. The ears are not pricked forward or pressed back or down. The next time that your dog is lying contently in the yard or is resting on the couch with you at night, take a look at her ear position. What you are seeing is probably your dog's natural, neutral ear position. When your dog is intrigued by something or on alert, he'll prick his ears up, states PetCoach. Sometimes, your dog will prick his ears in order to hear something better. Pricked ears indicate that a dog is attentive and engaged, and you will probably see your dog do this when he is playing or exploring a new area. According to PetCoach, your dog will probably pull her ears slightly back when she's feeling friendly. This ear position is usually accompanied by a wagging tail. Your dog pulling her ears back slightly can mean she is greeting you. She may approach you with this stance when she is hoping that you will play fetch with her or when you have just arrived home after a day at work. This change in your dog's ears is slight, so you will have to look carefully to spot it. When your dog pins his ears, he may be indicating a few things. According to PetCoach, a dog who loosely pins his ears back and down is showing submission. You have probably seen your dog assume this position when meeting another dog, and he probably laid or crouched down when he did it. If you have caught your dog in the act of being naughty, he probably loosely pinned his ears in submission after realizing that he had been caught. If your dog tightly pins her ears down, then she is showing severe anxiety and is telling you that she is very uncomfortable with the situation. The Bark explains that if your dog tightly pulls her ears back against her head in fear, you may notice other signals, too, such as dilated pupils. Your dog may also pull the corners of her mouth back. If your dog's ears are tightly pinned, look for other signs of anxiety, such as panting, overall body tension, or a flicking tongue. Dogs often pull their ears back tightly when they are about to bite, and this pinned ear posture may be your dog trying to protect her ears from getting injured. Work to get your dog out of whatever situation has prompted her to assume this posture since she is telling you she's uncomfortable and may escalate to biting if pushed too far. Your dog is giving you and anyone else present signals to back off, so be sure to recognize those signals and respect her wishes. Watching the rest of your dog's body can help you to better understand what his ear posture is communicating. According to Vet Street, your dog's tail can convey plenty of messaging, too. For instance, if your dog is holding his tail high and erect, he is probably focused on something, so you'd likely see this position in conjunction with pricked ears. A tail held close to the ground can indicate that your dog is relaxed or that he is uncertain or submissive. If your dog tucks his tail in close to his body, he is very fearful, so if you see this behavior paired with tightly pinned ears, it is an indication that your dog is highly uncomfortable, and you need to remove him from the situation. Your dog may also wag his tail hesitantly when he is feeling a bit nervous. You may notice a slight tail wag that is slower than normal or that moves irregularly. While your dog isn't to the point of reacting by biting in fear yet, this tail signals that he is not comfortable with the situation and that things could escalate. 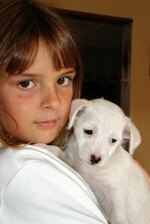 If you are having trouble understanding what your dog is communicating, or if you would like to learn more about dog expressions and body language, there are plenty of resources to help you out. You can find photographic references online demonstrating different dog body language signals, but it may be even better if you can work with someone to better understand your dog. Start by asking your vet for a referral to a local canine behaviorist. A good canine behaviorist can observe and assess your dog, and she can show you what body language signals your dog is demonstrating. Learning to read body language takes time, but with a little help and guidance, you can better understand what your dog is communicating visibly.